ZRemesher has been updated in ZBrush 2019 to have better support for hard sur­faces models, with a focus on re-topologizing meshes resulting from Live Boolean opera­tions or imported from CAD 3D packages. ZRemesher is now able to better detect hard surface edges, producing fewer poly­gons and with better accuracy. In addition to the use of PolyGroups to drive retopology, it is now possible to use Creased edges which will be preserved in the resulting topology. Because ZRemesher has been massively rewritten, the resulting topology may be different from V2. For this reason you can still access the original algorithm and choose which result better fits your needs. Some examples of hard surface retopology created by ZRemesher v3. Models by Ralf Stumpf and Daniele Angelozzi. Automatically producing topology which will best your needs is more and more a reality, thanks to ZRemesher. The new algorithm is able to produce better results on hard surface models. However, for some organic models the previous algorithm may provide better results. A Legacy mode is available for this reason. 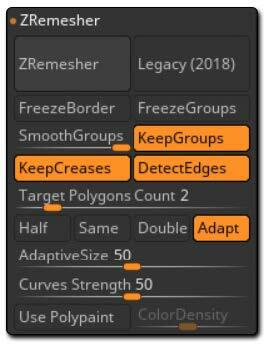 When selected, ZBrush will use the ZRemesher v2.1 algorithm. Using Legacy mode can be beneficial with organic models where the edge flow may be different and in some cases, more interesting. Only your eyes can tell you which topology will better suit your needs! The major change in ZRemesher V3 is improvement in hard surface retopology. ZRemesher is able to produce optimum topology for hard surface models – especially those coming from Boolean operations, whether created in ZBrush or imported from CAD software. To produce the best results, enable the Detect Edge function. This will look for topologies which create a hard angle such as the border of a cut piece, then use that information for creating the new topology. This function is really designed for hard surface models. 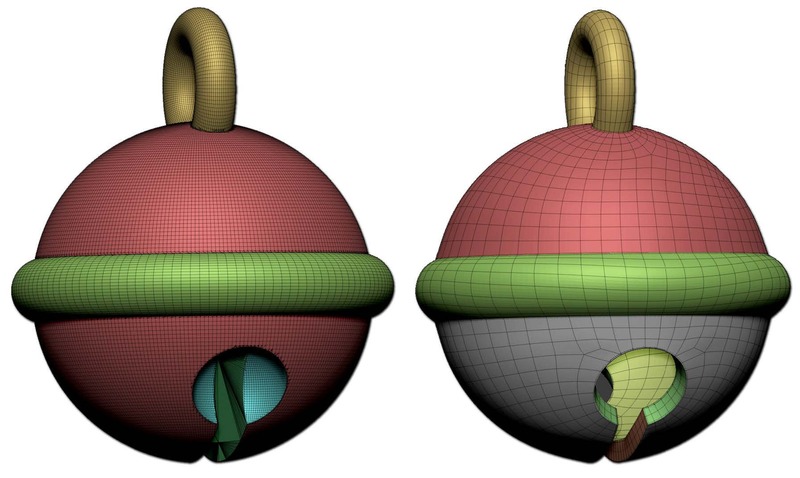 If your input mesh is a DynaMesh with a topology that lacks clean angles, the Detect Edge function will produce less accurate topology results. If your mesh has crease edges, a new ZRemesher option allows these edges to both drive the flow of polygons and serve as border edges. In addition to these functions, keeping the PolyGroups can be even more helpful and generate a better retopology. An example of a simple Boolean operation which produces complex topology. 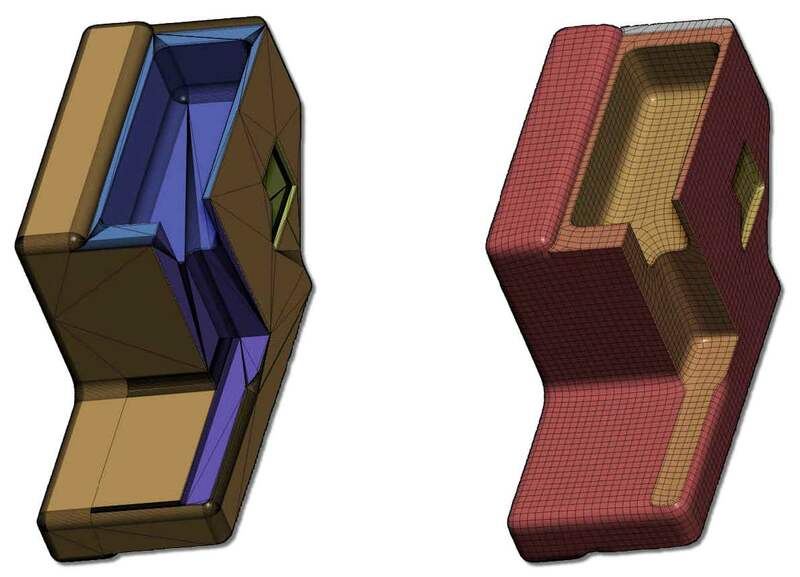 ZRemesher is able to create clean topology with dedicated PolyGroups in one click. Model by Ralf Stumpf. Keep in mind that hard surfaces models have a lot of variation in the direction of their topology. For example, there are sometimes long and thin surfaces connected by tiny extrusions. The more information you can provide to ZRemesher through creased edges, PolyGroups and edge detection, the better your results will be. Target polygon count and Adaptive mode will also have an impact on the results. If you set a higher polygon count you will give more freedom for the algorithm to navigate the quick changes in geometry that are specific to hard surface models. An example of an imported CAD model, retopologized by ZRemesher. The new topology is now perfect for using with ZBrush creation tools or even adding subdivision levels. Model by Cki Vang. The following functions have been added to the existing ZRemesher functions located in the Tool >> Geometry >> ZRemesher sub-palette.